The resort is perched on a scenic hillside. Several intimate beach coves offer snorkeling, surfing, and relaxation. Luxury residences offer sweeping views of the ocean. Championship golf is a putt or two away. Lounge by a number of pools throughout the resort and take in the scenery. Catch a glimpse of local surfers or join in yourself. Take the nature trail along the lava rock cliffs above the sea. You're right next to two PGA tour courses at Kapalua Golf Club. Take romantic hikes along the cliffs and discover secluded beach coves. Far north in Kapalua, all you'll hear are ocean waves and gentle tradewinds. You're perched on a hill overlooking lava rock cliffs and lush rainforest mountains. Kapalua Villas Maui is a peaceful condo resort perched on the cliffs of an expansive nature preserve on the north tip of West Maui, far from the crowds of Ka’anapali Beach. This Maui resort gives you access to several beaches, tucked inside intimate lava rock bays. 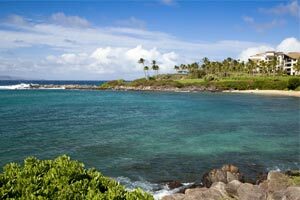 You also receive discounts at the resort’s two championship golf courses at Kapalua Golf Club. Take a dip in one of the eight outdoor pools, or grab a lounge chair and relax with a good book. When the kids get hungry, fire up the poolside BBQ grills for a family cookout, or dine at any of the eight on-site restaurants. After lunch, relax in the hot tubs or head to the beach for sunbathing and snorkeling. Back at the resort, get in touch with your inner-Serena Williams on the ten tennis courts. Individually owned and decorated one- to two-bedroom condos sleep four to six guests. Views include Oceanfront, Ocean, Partial Ocean or Fairway. Full kitchens have what you need to whip up anything from snacks to four-course dinners. Bake up a batch of chocolate chip cookies and let the little ones help with the mixing (and the tasting). In-suite washer/dryers will come in handy for post-chocolate cleanup. Living rooms come equipped with wet bars. Enjoy a low-key family movie night thanks to the flat screen TV with cable and DVD player. Have the kids pack favorite movies from home to watch. Gather everyone on the couch with a selection of snacks and get ready to laugh. Private, fully-furnished lanais are perfect for watching the sunset. Gold condos are renovated and offer updated appliances. Take advantage of the free area shuttle, included in the cost of the resort fee, to check out all of the excitement surrounding Kapalua Villas. Up for a game of golf? You’re in luck. The Kapalua Plantation Golf Course has you covered. This par three course is over seven-thousand yards, was designed by Bill Coore and Ben Crenshaw and was named the best golf course in Hawaii by Golf Week Magazine for ten consecutive years. It’s also home to the PGA Tours Tournament of Champions. Treat yourself to a facial, massage or nail treatment at Spa Montage, located at Montage Kapalua Bay, just a short drive or shuttle ride from Kapalua Villas. This thirty-thousand square-foot spa offers a day pass (for a fee) that also includes the use of the state-of-the-art fitness center.